John was born on Feb 2, 1943, in Eugene, Lane, Oregon, United States. His father was John Gallegos also and his mother was Lala Gallegos. He was the 5th child and John asked his father why did you wait to give your name to me. He said his dad said he just knew it was right. John's family moved around a lot doing seasonal work. John got rheumatic fever when he was nine. John family had to go Arizona so he could outgrow it. John's little brother Mike was run over by a drunk driver walking home when he was 9 yrs old and they were like twins.John got a blood clot in his left eye and was blinded at age 14 years. So no more boxing or playing ball. He worked driving a forklift operator at Rolland Jones in Rupert and at Simpolts in Hermiston to. He also worked in a meat packing company cutting meat in Nampa, Idaho. In the 1960's he worked for Kelly Bean warehouse and he fell off the bean scalper and fell 20 feet onto concrete and he was standing up. He broke both legs and shattered his left heel and was told he would never walk but he told the doctors watch me. Then he was working for JK Farms for the last 10 years or more. John only went to the 6th grade of school. His father pulled him out to help work in the fields to help feed the family. He has 6 brothers living Manuel, Tony, Henry, George, Gilbert, Andy. He has 5 sisters living Rae Archuletta, Delores Martinez, Rosemary Mort, Anna Villafuerte, Lilly Gallegos. His parents and grandparents have passed on. His brothers Mike and Alfonso and sister Genvieve passed on also. John was married 3 times and 1st marriage was to Ruth Herrera and she is passed on also they had a son Steve. Steve married Magaret Gurele and had two children Toni Ann and James and Toni Ann has 3 children Sean, Joseph,Teyann. James has 2 children Tegan and Ethan Johnny. John 2nd marriage was to Irene Vigil they had 5 children Jake and Mike both died and he has 2 daughters Annette, Carma, and granddaughter named Susy who is an attorney in Seattle,Washington, and many grandchildren and great-grandchildren. Mike died on the same day his father died but in Hermiston, Oregon in car wreck. John meet Murriel Bradshaw Cottom in late 1982 in Rupert, Idaho. They were married in 1983 in Elko Nevada. Murriel had two sons Tony and Dennis.Then in 2014, they were sealed in the Bountiful Temple in Utah. John was baptized in 1996 in the Church of Jesus Christ of Latter Day Saints. He greeted people coming to church and handing them a program with his wife Murriel at the Church in Acequia for 8 years or more. John loved to play cards with all the family and go to the casino once in a while. John made and sold tamales out here in our little town of Acequia. He raised hot chili peppers and shared them with others. The family had lots of dinners and he always took hot chili and some of the family said it was way to hot. 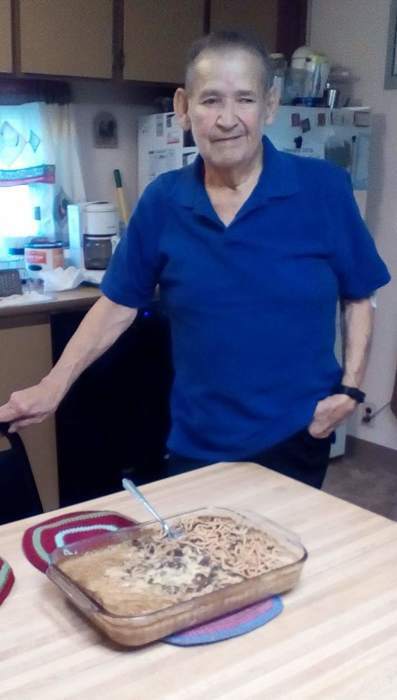 John went fishing when he could and said he never catches fish but has alot of fun going and being with his family and friends.John's doctor put him on Hospice care on Saturday Jan 12, 2019. This hospice group is called Harrison's Hope and they were great to us. Kathy and Barbara went way out of their way to take care of all the family that came to see John. Bishop Sam Crane and Chaplin Arlis also. I need to Thank Hansen mortuary for all they are doing also. I need to thank everyone who has called and dropped food off also. My sister Geri Rogers and Ken her husband helped us today at the mortuary to finish things and I wanted them to know I thank them also and my son Dennis. If your thinking about sending flowers due to allergies no fresh flowers,artificial or green plant or leave a donation in Memory of John Gallegos at Hansen Mortuary or mail it to us at 20704 5th st Rupert, Idaho 83350. A favorite memory of Uncle John is from his nephew George Gallegos Jr. When George was about 14 years old he wanted a summer job to earn some money. Uncle John told George he had been working for a farmer hoeing beets and he could help him for the summer. Uncle John picked George up really early for his first day of work. They went to the field and prepped for the day. They went up and down rows back and forth hoeing beets for hours until a man in a truck drove up and asked what they were doing. Uncle John told the Man they were hoeing the field for this specific farmer. The man replied, well this is my field and I didn’t hire you to hoe my beets. The field you need is on the other side of this road. George learned that day that hard work doesn’t always pay! They were tired and exhausted and went home with no money for the hard days work. George will never forget the time he spent with uncle John hoeing the wrong field for summer money he never got paid!